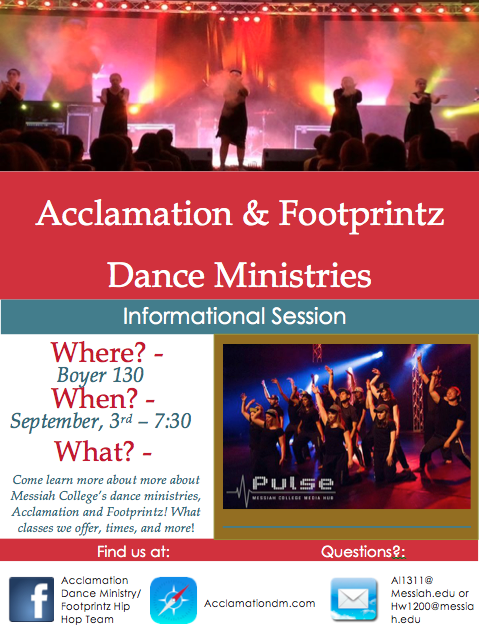 We are so excited for our 2015-2016 school year to start and we can’t wait to get Acclamation up and running again so we can see what God has in store for us! To find out more about our class schedules, what we have to offer, and to sign up, please come to our informational session Thursday, September 3rd, at 7:30 pm in Boyer 130. We are pumped to share our vision and theme for this year! Click on the image below to get a full view of this years flyer, and bring your friends! Previous postYouth Quest Dance Workshop!! Next postThe Beginning of a Good Year!